For many a British roleplayer their first introduction to RuneQuest and thus Glorantha, was not through roleplaying, but through fiction. Short, one or two-page pieces of fiction that appeared in the pages of White Dwarf magazine between 1982 and 1984, which told some of the stories and capers of Griselda, adventurer, thief, troll-friend, and sometime ‘hero’, but always a thorn in the side of the authority in and about the city of Pavis and the adjacent ruins of the Big Rubble. Starting with ‘Lucky Eddi’ in White Dwarf #29 and ending with ‘All in the Family’ White Dwarf #51 in 1984, readers got to hear the exploits of the notorious redhead as told by Olaf Dickin’s-son, known around Pavis as a small-time bookie, teller of tales, and occasional professional prayer. In the years since, further stories have appeared in the pages of other RuneQuest and Glorantha-related titles, including game supplements like Chaosium, Inc.’s Pavis and Big Rubble and magazines such as Different Worlds, Tales of the Reaching Moon, and Trade Talk. A great many of these tales were brought together with a little background in 1993 by the Reaching Moon Megacorp as The Collected Griselda. Then almost a decade later, in 2001, this was reprinted as The Complete Griselda which collected all of the original tales—and more. The anthology opens with ‘Lucky Eddi’ and ‘Griselda Gets Her Man’, which tell of how and why Griselda comes to Pavis and settles the first of a score or two before making a good deal with a Dark Troll in ‘A Tasty Morsel’. We get to see her run a scam or three or four or more, such as in ‘The Great Chart Caper’; protect her reputation much like a Wild West gunfighter as many a potential rival, such as ‘Red Hot’, attempts to take her down; have to deal with too many family issues—not always her own, like ‘The Trouble With Nephews’; all before getting a glimpse of Griselda’s future reputation in ‘The Cradlesnatchers’. There are almost thirty stories in The Complete Griselda, roughly covering the period between 1613 and 1621, the years running up to the Hero Wars when Pavis was under Lunar occupation. In addition, the anthology adds more to Griselda’s world than just the tales themselves. There are points of view from the good, the bad, and the Uz around the city of Pavis, which sets the scene for the tales to come, as does the map of Pavis itself. As well as a biography of Griselda there is even a Griselda songbook, containing four songs. These are nicely done and quite amusing. As much fun and entertaining as the stories are in The Complete Griselda—and there should be no doubt about that—they do not necessarily reflect RuneQuest and Glorantha as they are roleplayed. Certainly not in 2018. Exceptions abound, of course, but the focus for both RuneQuest in 1982 and the more recent RuneQuest: Roleplaying in Glorantha is typically on adventures that take place in the centre of Dragon Pass and a rural environment and on the conflict between Sartar and the Lunar Empire. The adventures of Griselda take place in an urban environment and concern her criminal and semi-criminal adventures. This reflects the style of the tales told in this anthology, which is as a Damon Runyon pastiche. Runyon, a noted New York news and sports journalist during the nineteen thirties and forties, wrote two collections of stories, On Broadway and From First to Last, set in and round the bars and joints of the city’s Broadway. Notably, the stories a lot of vernacular and slang and they are strictly written in the present tense, all narrated by the same, unnamed raconteur with a gentle humour and sense of irony. The author of The Complete Griselda adopts the same style, the stories being regaled in the present tense and accompanied no little slang. Unlike Runyon though, the author names his narrator. This is the aforementioned Olaf Dickin’s-son, not so much the nom de plume of the anthology’s author, Doctor Oliver Dickinson, but his alter ego. Dickinson is an English academic specialising in late Bronze Age Greece, who also edited the ‘Rune Rites’, the RuneQuest column which ran from White Dwarf #30 to White Dwarf #73. If Griselda is the star of the anthology, then it is the words of Olaf Dickin’s-son that make her so. One side of effect of being a Runyon pastiche is that the stories in The Complete Griselda need an audience. Just as those in On Broadway and From First to Last, these stories demand to be read aloud, preferably with a drink in hand—though probably not a troll drink. New York accent optional, of course. Of course, The Complete Griselda is not actually complete. It was after all, published in 2001 and there have been new stories since. A handful—‘Ogre Hunt’, ‘Meet the Parents’, ‘No Way for a Lady to Behave’, ‘A Day at the Races’, and others have been published as chapbooks by Tentacles Press as fundraisers for the Kraken convention in Germany. These are longer tales than those original White Dwarf appearances of Griselda and are also available as PDFs from Chaosium, Inc. 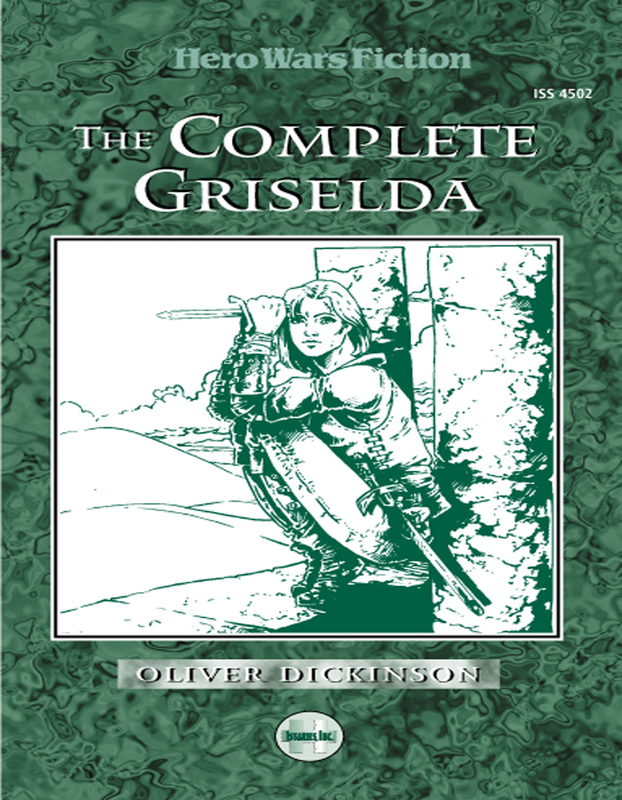 Originally published by Issaries, Inc., The Complete Griselda is also available from Chaosium, Inc. as a PDF. Physically, The Complete Griselda is decently presented. The black and white cover artwork, which is supposed to depict Griselda, feels rather generic, but the maps inside—one of Pavis and one of the adjacent Big Rubble—are well done. The text is presented in a sans serif font, so is not quite as easy to read as if it were a serif font. As much as the stories in The Complete Griselda do not necessarily reflect the way in which RuneQuest is played, that may change with the planned publication of updated versions of Big Rubble in 2019 and Pavis in 2020, both to be written by Robin D. Laws. These are the locations where Griselda’s stories take place and so hopefully the two supplements together will provide a stage where the players and their characters can carry out similar capers and have similar adventures. Of course, these stories are the perfect inspiration for such adventures. Until then, these stories are not necessarily a good introduction in general to the world of Glorantha. Nevertheless, the twenty-nine stories in The Complete Griselda are most enjoyable, and they do bring the exploits and tales of the ne’er-do-wells and miscreants who frequent Loud Lilina’s and—occasionally Rowdy Djoh Lo’s—to life in a highly entertaining and singular fashion. The Complete Griselda is rife with great characters, fun plots, and the type of situations in which player characters all too find themselves, but most all it is full of damned good stories. Before the advent of Dungeons & Dragons, Third Edition, the market for scenarios and other content was of course dominated TSR, Inc., but there were plenty of third party publishers too. Judges Guild of course, but also Mayfair Games as well as smaller publishers like such as Daystar West Media Productions (which would actually be bought out by TSR) or Phoenix Games, Inc. In the United Kingdom, TSR, Inc.—in the form of TSR (UK), Inc.—dominated Dungeons & Dragons support, with the ‘U’ and ‘UK’ series of modules. Yet there were third party publishers too who typically released one or two titles and for the most part, both titles and their publishers remain obscure some three or four decades on. No Honour in Sathporte from Chaotic Intellect Products and Northern Sages’ highly regarded Starstone are both typical of this. The biggest British publisher to release adventures for Dungeons & Dragons at the time though, was Games Workshop. A few years before the leading hobby games publisher in the United Kingdom switched focus to its miniatures and wargames, it released two titles for use with Dungeons & Dragons and more—and they were odd beasts too. 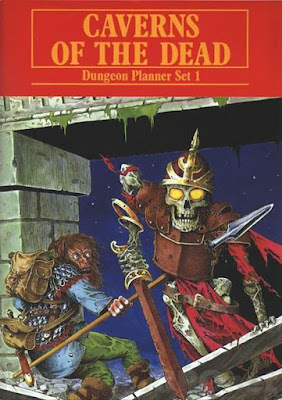 The two titles were Dungeon Planner Set 1: Caverns of the Dead and Dungeon Planner Set 2: Nightmare in Blackmarsh and they were part of the Dungeon Planner series—of which they were the only entries. Each Dungeon Planner title was a boxed set which contained “...[a] complete adventure for use with fantasy roleplaying games such as RuneQuest, Dungeons & Dragons, or Warhammer.” In addition there were maps of an area plus its local history, and it was intended that this would build into a region as the series proceeded and in turn added dungeons, tombs, wizard’s lairs, villages, towns, and so on. The aim of the Dungeon Planner series was to save the Games Master, “...[a] great deal of tedious writing…” and claimed that, “We do the paperwork: you have the fun!” What this means is that any associated preparation time is designed to take hours rather than days. Designed by Gary Chalk—whose son, Titus, wrote Generation Decks, the history of Magic: The Gathering—Dungeon Planner Set 1: Caverns of the Dead is the first entry in the series. Underneath the impressive cover depicting a scared adventurer being surprised and attacked by a skeletal warrior, Dungeon Planner Set 1: Caverns of the Dead asks what the adventurers will find the Royal Tombs of Eastern Koss—vampires, a bandit gang, or the tomb and treasures of the legendary Orm? Inside can be found a Game Master’s Screen and booklet, an area map, and an A3-size poster map showing the floorplans of The Royal Tombs. The very first thing inside the Dungeon Planner Set 1: Caverns of the Dead box is the Game Master’s Screen and inside that is the booklet. The screen is done in light card, its outside again showing the cover of the box and a one-page general history of Eastern Koss. The Caverns of the Dead of the title are in fact, the Royal Tomb of the royal house of Koss, supposedly built by the house’s founder, a nobleman named Orm. The tomb complex is at least four hundred years old and has been used intermittently by the royal house over the course of this time. When in use, it is properly staffed by tomb keepers and guards, but at other times, has been left all but abandoned. Like the outside of the screen, the inside of the screen is divided in two, but is done in black and white rather than colour. On the one side is a plan of the Royal Tomb complex, all marked up with room numbers, ready for the Game Master’s reference. On the other side, is a set of encounter tables for the tomb complex. In fact, there are three sets of encounter tables, one for each of the possible conditions that the tombs might be found in. The first is if the tombs are in use and are fully staffed with tomb keepers and guards and tables are also provided for tomb keeper, novice tomb keeper, and tomb guard activities. So in this situation, the player characters might encounter a party of grieving royals and their retainers or novice tomb keepers playing leapfrog! The second set of tables is for the tombs if they in a neglected state, so a party might encounter a dead tomb keeper, bandits, or an urchin graffiting a wall! In this situation, the tomb keepers and tomb guards have retreated away from the main areas of the complex and are unable to maintain it. The third and final table is for when the complex has been totally abandoned and it is essentially for when the Game Master runs Dungeon Planner Set 1: Caverns of the Dead as a dungeon crawl. The booklet details and explains what is in the Dungeon Planner Set 1: Caverns of the Dead before delving into the tomb itself. Eight plot hooks are given, the most notable of which suggests how the adventure could be run using Warhammer—the early edition of the fantasy battle game—rather than a roleplaying game. To be fair, they are not that interesting in part because they are not tailored to a pre-written adventure. The actual complex consists of thirty doors, ten corridors, and twenty-nine individual locations. The doors have a table to indicate their status, the corridors have no description, and the locations each typically have a two or three sentence description. The descriptions are full of little details which are left hanging with no further explanation. For example, the Tomb of Prince Hargon has a faded frieze which depicts his victory over the Orcs on the Plains of Tagor, but who is Prince Hargon and where are the Plains of Tagor? Below each description are several dotted lines where the Game Master can note the encounters to be had in that location or corridor and possible treasure to be found—if any. Rounding out the Game Master’s Booklet is much longer section for her notes and a map which again depicts the tomb complex, but which has room for her to expand the map. All of this feels reminiscent of another adventure, one of the very first to be published for Basic Dungeons & Dragons. This is B1 In Search of the Unknown, published in 1979, in which, famously, the Dungeon Master fills in the inhabitants and encounters to be found in the ‘Caverns of Quasqueton’, typically from a set of options provided in the back of the module. Just as this design format had a profound format on the nature of B1 In Search of the Unknown, it had a profound effect on Dungeon Planner Set 1: Caverns of the Dead and Dungeon Planner Set 2: Nightmare in Blackmarsh. It requires a greater degree of preparation than a pre-written scenario as the Game Master has to populate the dungeon and add some kind of plot to the scenario. Of course, in doing so, the Game Master will make the adventure in Dungeon Planner Set 1: Caverns of the Dead hers rather than the author’s. Of course, the encounter tables given in the Game Master’s booklet are more directed to telling a specific set-up—or rather three specific set-ups—than the monster lists in B1 In Search of the Unknown and so there is a stronger basis for plot and story. Below the Game Master’s Screen and booklet is the A4-size area map of Eastern Koss. This depicts an area forty by twenty-eight miles with just a few locations—two villages, an inn, various runestones, the remnants of Ormsdyke (part of which is snake or serpent-like), and of course, Orm’s Finger where the Royal Tomb is located. The Game Master will need to develop these other locations herself as no information is given about then, although it would have been nice if such details had been included, perhaps on the reverse of the map, which is otherwise blank. Lastly, under everything else in Dungeon Planner Set 1: Caverns of the Dead is the full colour, A2-size map of the Royal Tomb. It is done in 25 mm scale, on very sturdy paper, and is designed to be used with miniatures—miniatures that of course, Games Workshop, or rather Citadel Miniatures sells—and of course, it is compatible with Games Workshop’s line of Dungeon Floor Plans sets. So it is big and bold in a rather workmanlike fashion. It is not necessarily a fantastic piece of cartography, but once on the table with the addition of miniatures and perhaps a little dungeon dressing, there is no doubt that it will look impressive. Physically, Dungeon Planner Set 1: Caverns of the Dead is a lovely thing. Perhaps the Game Master’s booklet feels a bit thin and perhaps there could have been some more details on Eastern Koss, but the production values are otherwise really nicely done. At the start of the review, Dungeon Planner Set 1: Caverns of the Dead was described as being an adventure for Dungeons & Dragons. This is true. This is also untrue. In actuality, Dungeon Planner Set 1: Caverns of the Dead is a generic adventure as there are no game stats at all given for any of the suggested creatures or encounters. Yet the monsters and encountered listed on the three sets of Encounter Tables are those taken from Dungeons & Dragons—Hobgoblins, Kobolds, Paladins, and what-not are de facto Dungeons & Dragons monsters. Arguably, some could be said to generic creatures—giant rats, wolves, and so on—but the suggested monsters are those of Dungeons & Dragons. Of course, this makes it easy to adapt Dungeon Planner Set 1: Caverns of the Dead to the roleplaying game and setting of your choice. Dungeons & Dragons would be easy, Warhammer or Warhammer Fantasy Roleplay would be barely a little more difficult as would HARP, whilst roleplaying games with a stronger setting, like RuneQuest and Glorantha, would be a great deal more difficult. This is not to say that it could be done, but the more generic the roleplaying game in terms of its fantasy, the easier it would be to adapt. As an adventure and a dungeon, Dungeon Planner Set 1: Caverns of the Dead still needs preparation and more preparation than a pre-written scenario normally requires. It is more of a halfway house between an unwritten and pre-written adventure. There is certainly potential in terms of plot and theme to be found in Dungeon Planner Set 1: Caverns of the Dead, along with some of the means to extract and develop that. Unfortunately, as much as Dungeon Planner Set 1: Caverns of the Dead and the Dungeon Planner series develops the concept and supports it with some great maps, it awaits the input of the Game Master—or the Dungeon Master—to make it memorable. In all of its thirty-seven years and seven editions, what the premier roleplaying game of Lovecraftian investigative horror has never had is a starter set. Now the most recent edition of the rules—Call of Cthulhu, Seventh Edition does have the Call of Cthulhu 7th Edition Quick-Start Rules, which provides an introduction to the rules and setting as well as giving the most recent version of ‘The Haunting’, the classic scenario which graced the pages of every edition of the roleplaying game prior to its current edition. Further, there is also Doors to Darkness: Five Scenarios for Beginning Keepers, an anthology of scenarios designed to help both Keeper and her players learn both how to run and play the game. At the end of 2018, the publisher of Call of Cthulhu, Chaosium, Inc., rectified this lack by releasing the Call of Cthulhu Starter Set. The Call of Cthulhu Starter Set is designed to do three things. First, provide everything a player needs to start playing Call of Cthulhu, Seventh Edition. Second, provide everything a Keeper needs to start running a game of Call of Cthulhu, Seventh Edition. Third, take a player on a step by step process that will begin with a single player roleplaying a single player character—or investigator—in a solo adventure, then involve a Keeper running a scenario for a single player and his investigator, then have a Keeper run a scenario for two players and their investigators, and finally, have the Keeper run a scenario in traditional sense of having three or four or more player characters. It does with a richly appointed box of bits and pieces that echoes the roleplaying games of times past—there are dice and character sheets and pre-generated investigators and books and handouts! The starting point though, is ‘What’s in this Box?’. A classic mainstay of roleplaying games past which came as boxed sets, ‘What’s in this Box?’ is the first thing that the reader sees upon opening the box. The single sheet explains what is in the box and what the reader should look at next and in what order, for the contents of the Call of Cthulhu Starter Set are packed in the order they are meant to be used. Before that at the top of the box is a set of dice, a full set of the dice commonly used in Call of Cthulhu. Notably though, it includes not one percentile ten-sided die, but two! Now in Call of Cthulhu, two ten-sided dice are rolled for most situations and actions, whether skill checks or Sanity checks, but sometimes there are situations where an investigator is at an advantage or disadvantage. In either case, his player gets to roll an extra die, an extra ten-sided die so that two are rolled as well as the units die. When the investigator rolls with advantage, the player rolls the two dice and keeps the best, but rolls the two dice and keeps the worst wen at a disadvantage. The inclusion of the extra die enables a player to roll these dice without having to roll any of them twice. It not only supports the roleplaying game’s mechanics, but it makes them easier to play by taking away the obviously minor inconvenience of having to roll dice again. It is a small touch, but it helps. Immediately below the ‘What’s in this Box?’ sheet is an advert for MetaArcade’s Cthulhu Chronicles and below that is a sheaf of ten investigator sheets. Five of these are blank, but the other five are filled out as pre-generated investigators. The five are all illustrated with a full-colour portrait and consist of a female African American history student, a female Japanese American science student, a female engineering student, a male archaeology professor, and a male languages professor. Putting aside the groanworthy name of the archaeology professor—Nevada Jones—this is a good mix and a good balance of characters in terms of gender and race. All five are ready to play and all come with their back stories all filled out as roleplaying hooks. Under all of that paper is the first of the three books in the Call of Cthulhu Starter Set. Book One—Alone Against the Flames. As the title suggests, this is a reprint of Alone Against the Flames, the first designed to be played by the one player for Call of Cthulhu, Seventh Edition. It sees the player character travelling to make a new life in the New England town of Arkham when circumstances force him to make an overnight stop in the village of Emberhead and there events threaten everything he understands and in the process, transforms him into an investigator. Mechanically, it also takes the reader through the process of creating a character ready to play and shows him how the rules work. The most obvious changes to Alone Against the Flames are cosmetic. It is presented in full colour where the previous version was not and comes with more illustrations. The major difference is that where the original version of Alone Against the Flames referenced the Call of Cthulhu 7th Edition Quick-Start Rules for an explanation of its mechanics, this version instead references Book Two—Introductory Rules of the Call of Cthulhu Starter Set. Book Two—Introductory Rules is not only the second book in the Call of Cthulhu Starter Set, but also the shortest. It covers the key points of the Call of Cthulhu, Seventh Edition rules in just twenty pages, from core concepts, creating an investigator, skills, and Occupations to the mechanics of skill rolls, Sanity, and combat. Only a few Occupations are listed, but only a few are needed for the contents of the Call of Cthulhu Starter Set and a player is always free to create his own. A nice touch is that it comes up to date by referencing the modern explanations of the roleplaying game by Seth Skorkowsky and Paul Fricker. The rules are clearly and simply explained and decently supported by some examples of play. Rounding out the booklet is a guide to the reader’s next steps, the first of which is Book Three—Paper Chase and Other Adventures. The others are, of course, the Investigator Handbook, the Keeper Rulebook, the Keeper Screen Pack, and Doors to Darkness. The last and thickest booklet in the Call of Cthulhu Starter Set is Book Three—Paper Chase and Other Adventures. It contains three adventures designed to be run by the Keeper with first one, then two or three, and then more investigators, growing in depth and detail as more players and their investigators are required. It also sets up an organisation for the investigators to belong to and gain support from, this being the SEU or ‘The Society for the Exploration of the Unexplained’, as well as giving a reason why the investigators know each other. The SEU is an extra-curricular club based at Miskatonic University in Arkham and all five of the pre-generated investigators in the Call of Cthulhu Starter Set are members. The first of the three scenarios is ‘Paper Chase’, originally published in the Cthulhu Companion from 1983. It is a short, one session affair in which the investigator is hired by Thomas Kimball of Michigan to look into the theft of some books from his late uncle’s books. Clues point towards the uncle’s favourite reading spot, a nearby cemetery, which it turns out, has been the site of some odd happenings over the years. ‘Paper Chase’ is fairly benign scenario, really only deadly depending upon what the investigator decides to do. Of course, there is the sanity-sapping realisation that the truth of the world is not as the investigator knows it be, but this is a gentle introduction to Lovecraftian investigative horror and shows how although the Mythos is antithetical to mankind, aspects of it are not necessarily actively working against mankind. The upgrade of ‘Paper Chase’ to Call of Cthulhu, Seventh Edition is nicely done and provides support for the Keeper with advice and clear explanation of the rules as they arise. Another pleasing touch, is the new, full-colour artwork which includes new depictions of the scenario’s antagonist. The second scenario is ‘Edge of Darkness’, which is set in and around Arkham. This has been the mainstay of many a past edition of Call of Cthulhu—though not the current one—and after the ‘The Haunting’, is perhaps of one the most played scenarios for the roleplaying game. Thus, it is regarded as a classic. The investigators are asked to fulfil one last request by an acquaintance, Rupert Merriweather, who is on his deathbed. In his youth, he and friends dabbled with magic and foolishly brought into the world an evil force that could unleash horror upon the nearby surrounds if not dealt with. Being near death, he cannot and so asks the investigators to help. They are given some clues and a key to the farm house Ross’s Corners where the thing is currently contained and allowed to begin their investigation from there. ‘Edge of Darkness’ introduces wider possibilities of the mainstay to Call of Cthulhu game play—investigation. This is not say that there was no investigation in ‘Paper Chase’, but here there many more clues to follow up and enquiries to be conducted. Ultimately, the events of ‘Edge of Darkness’ will play out at the farm house itself, the investigators trapped within its confines by threats from within and without. There is also option to add a rival to the investigators’ investigative efforts in the form of Merriweather’s son, which gives the Keeper a good NPC to roleplay and possibly serve as a replacement investigator should one of their number die or lose their mind. ‘Edge of Darkness’ is locked room scenario which showcases the monstrous side of the Mythos and the dangers of mankind playing around with things—that is, the Mythos and magic—best left untouched. If ‘Paper Chase’ showed the ‘benign’ aspect of the Mythos and ‘Edge of Darkness’, its deadly and dangerous nature, then the third scenario in Book Three—Paper Chase and Other Adventures brings out its malignity in all of its glory. ‘Dead Man Stomp’, like ‘Edge of Darkness’ a mainstay of many a past edition of Call of Cthulhu, also ups the ante, the action, and the threat, but is set on a wider stage that acknowledges the social issues of the Jazz Age. In fact, it involves the Jazz Age itself in the form of an African American trumpet player who suddenly acquires the powers of resurrection—and not a good way! Set in New York, the investigators’ decision to visit a Harlem hotspot accidently lands them in a racy mix of the Mafia and crime gangs, Prohibition, and the undead. If ‘Paper Chase’ and ‘Edge of Darkness’ are a bit dry, then ‘Dead man Stomp’ is the perfect tonic, fast-paced and action-orientated with a period sense of the exotic. That said, the scenario does not ignore the racism of the period and shows how it help or hinder the efforts of the investigators. The scenario also includes a guide to the Harlem of the period, which is where the scenario primarily takes place. Overall, ‘Dead Man Stomp’ brings an exciting and energetic conclusion to the three scenarios in the Call of Cthulhu Starter Set. Lastly, beneath Book Three—Paper Chase and Other Adventures, is a booklet of Player Handouts. This collects and reprints all of the clues and handouts which the investigators can discover in the course of playing through the three scenrios in the Call of Cthulhu Starter Set. It also includes maps too, for easy reference by the Keeper. Physically, the Call of Cthulhu Starter Set is very well presented with everything in colour and with great new art. The new colour cartography is also nicely done. Likewise, the writing is also good. Overall, it is difficult to find fault with the Call of Cthulhu Starter Set, but there two points to be said against it. One is that the dice are rather plain and it would have been nice if some Call of Cthulhu-themed dice had been included instead given that this is the Call of Cthulhu Starter Set. Of course, that might have increased the price and so it is understandable that they are not. The other is more of an issue and a complaint. Simply that the three booklets could have had better, sturdier covers. The three booklets are going to be handled quite a lot and card covers would have afforded them the protection they currently lack. The Call of Cthulhu Starter Set has an audience it is specifically designed for and aimed at. It is not designed for the veteran Call of Cthulhu Keeper, especially if she has any experience running previous editions of Call of Cthulhu. The likelihood is that she already owns the classic scenarios that appear in Book Three—Paper Chase and Other Adventures and to be honest, updating from the previous editions of the roleplaying game to current one is not at all difficult. That said, there is nothing to stop an experienced Call of Cthulhu Keeper from purchasing the Call of Cthulhu Starter Set, especially if she wants to have those scenarios ready to run using Call of Cthulhu, Seventh Edition, as they are, after all, classic well-regarded scenarios for the game. 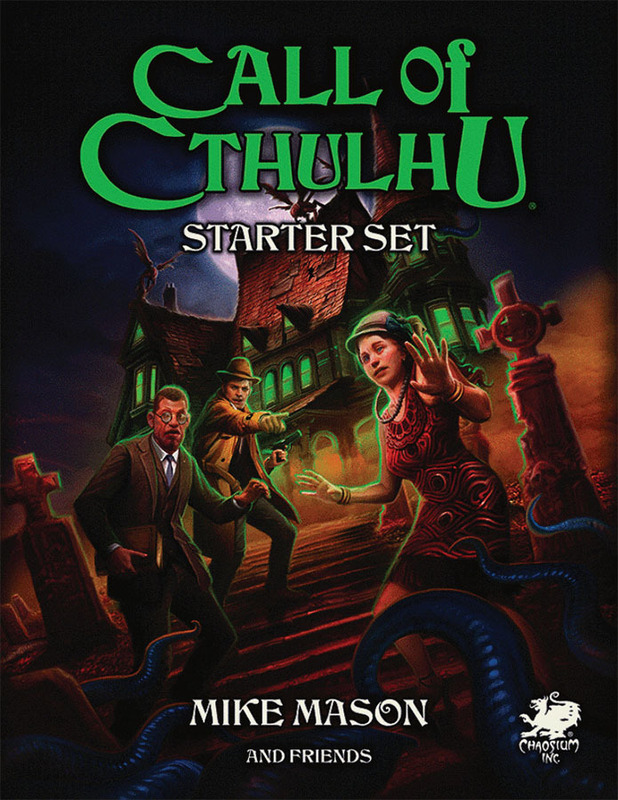 It goes without saying that the Call of Cthulhu Starter Set has everything that the potential player has to get started and whilst none of its content is necessarily new, the designers have clearly chosen that content because they know it works and they know that placed in the right order, it can teach the potential player to play and then run Call of Cthulhu. It does this right from the start before expanding and showcasing the scope of roleplaying game step by step, all in readiness to be able run and play the other adventures and campaigns available. Before that though, there is a lot of game play to be got of the high quality contents of the Call of Cthulhu Starter Set, making it not only the best value for money starter set available, but also the best introduction to Call of Cthulhu and best starter set for any roleplaying game currently available. 1974 is an important year for the gaming hobby. It is the year that Dungeons & Dragons was introduced, the original RPG from which all other RPGs would ultimately be derived and the original RPG from which so many computer games would draw for their inspiration. It is fitting that the current owner of the game, Wizards of the Coast, released the new version, Dungeons & Dragons, Fifth Edition, in the year of the game’s fortieth anniversary. To celebrate this, Reviews from R’lyeh will be running a series of reviews from the hobby’s anniversary years, thus there will be reviews from 1974, from 1984, from 1994, and from 2004—the thirtieth, twentieth, and tenth anniversaries of the titles—and so on, as the anniversaries come up. These will be retrospectives, in each case an opportunity to re-appraise interesting titles and true classics decades on from the year of their original release. Over the years, Dungeons & Dragons has returned again and again to face its tallest foe—the giants! Most recently Wizards of the Coast pitted adventurers against them in 2016’s Storm King’s Thunder, the sixth campaign for Dungeons & Dragons, Fifth Edition, but their first appearance was in a trilogy of scenarios which began with G1 Steading of the Hill Giant Chief and continued with G2 Glacial Rift of the Frost Giant Jarl and G3 Hall of the Fire Giant King. The three would subsequently be collected as G1-2-3 Against the Giants, which itself would form the first three parts of the campaign that would be collected in 1986 as GDQ1–7 Queen of the Spiders. In 1999, these three modules would be reprinted as part of the Dungeons & Dragons Silver Anniversary Collector's Edition boxed set and more properly revisited in Giants: The Liberation of Geoff. It would be followed in 2009 by Revenge of the Giants, the first ‘mega-adventure’ for Dungeons & Dragons, Fourth Edition, and then of course, in 2016 with Wizards of the Coast’s Storm King’s Thunder. Much of this history as well as critical response to both the individual dungeons and the collected G1-2-3 Against the Giants is detailed on Wikipedia. This is worth taking the time to read, so Reviews from R’lyeh recommends doing so before returning to this series of reviews. The ‘Giants Review’ series begins with G1 Steading of the Hill Giant Chief. 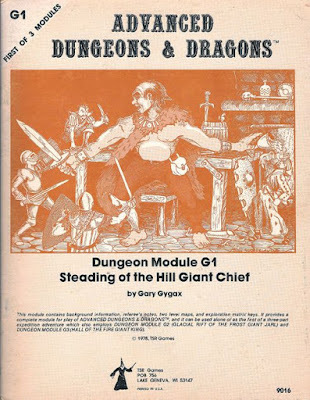 Published in 1978, G1 Steading of the Hill Giant Chief is significant because it is the first module to be published by TSR, Inc. and the first to be published for Advanced Dungeons & Dragons, First Edition. Like many of the modules of its time it began not as a module purpose designed for commercial release, but as a tournament adventure run at a convention. This and its age shows in its design, with an emphasis on combat, and to a lesser extent, dungeon exploration, over roleplaying. Its origins also explains the shortness of its length at just eight pages. Similarly, this emphasis on combat and the nature of its antagonists explains why the scenario is best played by nine characters of Ninth Level. In other words, this is a tough scenario designed to challenge both players and their characters. The set-up explains that the lands of the humans—nominally in the World of Greyhawk—have recently been beset by attacks by giants of various types. Against this unheard of occurrence the rulers of these lands have hired the player characters to deal a lesson to the Hill Giants. Should they fail, their heads will be upon the chopping block! Fortunately the party will be equipped and led to the steading of the Hill Giant chief itself and as the scenario opens, the party is ready to strike—and ‘strike’ is the right term because G1 Steading of the Hill Giant Chief is nothing more than a commando raid upon a ‘military’ base. G1 Steading of the Hill Giant Chief consists of two levels. The upper is a timber stronghold that consists of the Hill Giants’ living quarters. There are dormitories and barracks, common rooms and quarters for the sub-chief, the chief, and more. This is where Chief Nosnra—the name being a near anagram of the surname of Gygax’s co-designer of Dungeons & Dragons, Dave Arneson—Nosnra’s wife, and the rest of the Hill Giant tribe resides along with their Ogre servants. As the party begins its exploration of the Steading, it becomes apparent that at this precise moment, the Hill Giants are not focused on going out and conducting raids on the surrounding lands of the humans, but upon the guests that are currently paying the tribe a visit—there are other types of Giants present. In fact, they are attending a raucous party held by their hosts and with this set-up, the party could actually sneak all the way into the Steading without attracting the attention of anyone more than a few guards. This is the first indication that there might be something more to the Hill Giants’ activities than just simple greed. This focus is supported by some simple storytelling moments, such as the fact that the guards inside the entrance have drunk themselves into a stupor and the Hill Giantesses working in the kitchen are busying themselves into a frenzy as depicted in a delightful, if not great, piece of artwork by Dave Sutherland. These are indicative of Gygax’s naturalism that would really only come to the fore with B2, Keep on the Borderlands and T1, The Village of Hommlet. In comparison, the lower level of G1 Steading of the Hill Giant Chief is not so much a dungeon as a basement for the Steading above. Essentially, it is where the Hill Giants keep all of their utilities—armoury and smithy, storage rooms and wine cellar, cell blocks, torture chamber, and quarters for both the Hill Giants’ Orc slaves and the Bugbears that they use to guard them. That takes up half of the lower level though, the rest being partially collapsed tunnels, and natural caverns, the latter inhabited by more typical dungeon creatures. There is also a weird abandoned temple—quite literally that is its name—that is likely to send at least one player character insane… The effect of worked and unworked areas of the dungeon is somewhat divisive, especially so cramped together, and it feels forced and unnatural. Also found on the lower level is the Hill Giant treasury and it is here that is found the scenario's singular link to G2 Glacial Rift of the Frost Giant Jarl. It is both figuratively and actually a link, capable of transporting the party to the Glacial Rift of said second scenario. Although it comes with an explanation as to what it does, it is not easy to find and it is not really explained how it connects to the overarching threat behind GDQ1–7 Queen of the Spiders. There is no foreshadowing of the threat or of this device in G1 Steading of the Hill Giant Chief, and thus no obvious evidence of the threat behind the campaign. A more modern campaign would certainly address this issue, but G1 Steading of the Hill Giant Chief is one of the earliest of scenarios and only has eight pages, so space to do so is limited. Physically, G1 Steading of the Hill Giant Chief is tightly presented—not surprising given the eight pages that the module runs to. Within those pages Gygax fits in a lot of detail. There are just a few illustrations and they do vary in quality. As the first module to be published by TSR, Inc., there is a lot to like about G1 Steading of the Hill Giant Chief. There is a lot of information and description packed into its low page count, in fact everything necessary to run and play the scenario. What it lacks though, are strong hooks to the wider plot that would eventually be developed across the seven scenarios that make up the GDQ1–7 Queen of the Spiders. As a situation it also feels static, frozen at a moment until the adventurers enter and events can begin. Nor is there any advice about running the adventure or guidance as to how the Hill Giants might react should they discover the presence of the player characters. Lastly, what it really lacks and really warrants is a plot hook or two to pull the adventurers further into both the scenario and the campaign. There are hints of the possibility of an Orc slave revolt that the party could take advantage of, but this is not developed. Nowhere is it addressed what Chief Nosnra—or anyone—really knows, and really, the Dungeon Master will have to develop these plot elements himself. 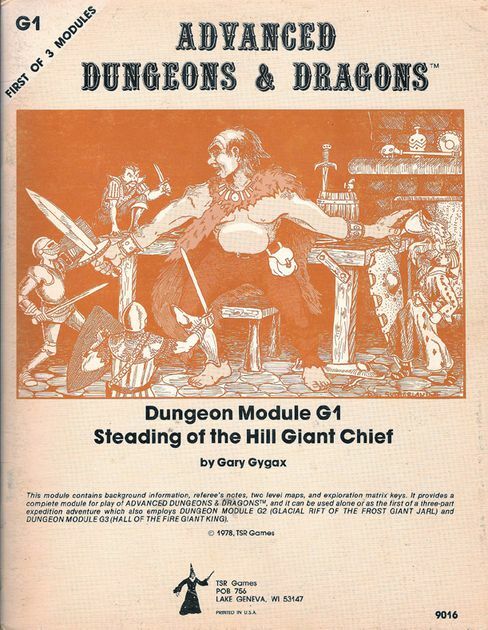 For 1978 and TSR, Inc.’s first module publication, G1 Steading of the Hill Giant Chief is a solid adventure that is true to the wargaming roots of both Dungeons & Dragons and Advanced Dungeons & Dragons. By modern standards, it feels underdeveloped and in need of the Dungeon Master’s attention to pull the Steading out from its static status and make it into a living locale. On this morning exactly forty years ago I would have joined my sisters in our parents’ bedroom at the top of the house at 1 Charles Street. There the three of us would sit at the end of the bed and open our stockings. Or rather, pull out and unwrap the presents that Father Christmas had left us overnight. These would be little things—games like Top Trumps, chocolate such as bags of chocolate coins, toys, books, comic book annuals (hardback specials based on our favourite weekly comic like the Beano or the Dandy), useful knickknacks such hairbrushes, and so on until you got to the orange in the toe of the stocking—all to be unwrapped and displayed to our parents at the top of the bed, semi-aware of course, that they knew what was in there having been wrapping them after we had gone to bed for the last few days. With three children of a similar age and a stocking to fill for each, it must have been a herculean task each year. That Christmas in 1978 would have been my last family Christmas, but it would also be my first adventure. In my Christmas stocking year that year were two books that were unlike anything that my eleven-year-old self I seen before. They were Tracker Books, which asked the question, “Would YOU like to go on an adventure?” These were one of the first series of solo adventure books, first published by Transworld Publishers Ltd. in 1972 and then again in 1978. There were twelve in the series, of which I was given two that year. One was Mission to Planet L, the other was Codebreaker. 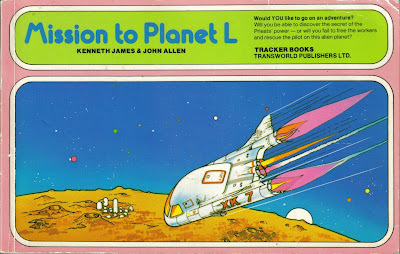 The first in the series though was Mission to Planet L and it is the one that I remember. It would have been perfect for me for it was a Science Fiction adventure and I was and am a fan of Doctor Who, Star Trek, and Star Wars, as well as being a big fan of Science Fiction in general. In Mission to Planet L you are the pilot of Patrol Ship XK7 sent by Earth Control to locate another patrol ship which has gone missing in Galactic Sector G8 somewhere in the vicinity of Planet L. After an encounter with pirates, you find yourself on Planet L and quickly enslaved and sent to the lasonite mines where you are expected to work for life. Fortunately, you are rescued by some of the workers who have formed a resistance movement against the priesthood who are in control. They will help you rescue the missing pilot and with your help, perhaps overthrow the priesthood. There are various possible outcomes, primarily being able to escape Planet L without being able to help the resistance or discover the secret of the priesthood’s control over the planet. So it is possible to only partially succeed, but having only partially succeeded is what will bring the reader back to see if he can get a better, more satisfying outcome. At just forty entries, Mission to Planet L is a fairly limited ‘choose your adventure’ style solo adventure book. It is quite linear and it offers only a few outcomes, and it does not use anything in the way of a game system. The limited length and the lack of a game system means that it does not have the depth or the detail of the more well-known Fighting Fantasy series and the numerous solo adventure books for Tunnels & Trolls. So Tracker series titles are meant to be read, rather than played. Nevertheless, Mission to Planet L is works very well as an introduction to the concept because of the design of its format. For unlike other solo adventure books, the Tracker Books are presented in landscape rather than portrait format. Each entry is done as a two-page spread. On the left-hand side the text explains what the reader can see and what his next action might be or the next location he can go to. On the right-hand side though, is an illustration. Sometimes this shows what has happened to the reader, as the patrol agent, up until the point where he needs to make a decision and choose a path. Here is the Tracker series adds another innovation—arrows in the illustrations indicating where those decisions are in what the agent can see and numbering those arrows with the pages they lead to as mentioned in the text opposite. Now not all of the arrows are really necessary. For example, one illustration depicts the arrows pointing to a pair of levers on the patrol ship’s control panel. One will bring the ship to a stop, so that the agent can surrender to space pirates, the other will activate the emergency boost which will hopefully enable the agent’s escape. Neither lever really needs an arrow, it is more a case that the format calls for it and that the format needs to be consistent. Now the illustrations are not great, but they are effective and there is Star Wars feel to them—which would have been perfect for the eleven-year-old me. The other element that the illustrations bring to replay factor of Mission to Planet L—just as in other solo adventure books with illustrations. As the reader flips back and forth of the book form entry to entry, he will spy new illustrations, ones he has not seen from his current or previous attempts to complete the adventure. Every time he sees a new illustration, his questions—and my questions as an eleven-year-old playing through Mission to Planet L—are, “How do I get to that scene?” and “What decisions do I have to take to get that scene?” In order to get there, the reader will have to start again and make some different choices. In terms of format, Mission to Planet L—and the Tracker Books—look like more like flip books than adventure books because of the illustration on the right-hand page throughout. One oddity is the language, which although written in the first person, is written in the past tense, so it is feels as if the reader is making a report and so lacking the immediacy of being written in the second tense and directly addressing the reader as ‘you’. By the standards of the solo adventure books that would follow a decade later—The Warlock of Firetop Mountain would appear ten years after this first entry in the Tracker Book series—Mission to Planet L is simplistic and easy to read. Yet there is something tentative here as if publisher and authors are doing something radical and new for the very first time, drawing up a blueprint upon which improvements and innovations can be made with subsequent entries in the series. For an adult this is a quick read, but for the intended audience of the young, but experienced reader, Mission to Planet L and the Tracker Books represented adventure and first steps into the concepts of interactive fiction. For the eleven-year-old me, Mission to Planet L was an exciting and enthralling read as I tried to successfully complete the mission of its title. It and the companion volume would be my introduction to interactive fiction and my first roleplaying experience, although I would not have known it at the time. Within a couple of years my life and my family—and certainly my Christmases—would be very different and I would learn about Dungeons & Dragons and want to play. Not long after that I did, but it all started with Mission to Planet L and although they would not have known it, they got me started with gaming and roleplaying. I am happy and thankful that they did. charging them favourable rates. It is rumoured that TTA will also employ underhanded means to maintain its monopoly. The twenty-fourth century of the Justifiers RPG is dominated by two technologies—Transmission of Matter and gene manipulation. Transmission of Matter or TransMat enables mankind to achieve interstellar travel, but is limited to a range of about six light years and is best done via a sending and receiving portal at a TransMatt Station of no more than twenty square feet in size. It is also not instantaneous, but it is twelve times faster than the speed of light. This still left the problem of exploring new worlds which did not have a TransMatt Station, but it possible to ‘blind beam’ a team into a suitable star system, have it land on a world, explore it, and then build a TransMatt Station in readiness to receive more explorers or colonists. Such teams are known as Justifiers, since they would also ‘justify’ as well as pacify any new planet they landed on. Originally, Justifiers teams were comprised of highly trained human explorers, but by the twenty-third century advances in gene design combined with the high costs and potential losses involved in using humans meant that corporations switched to using Beta-Class Humanoid Lifeforms, human-animal hybrids of equal or near equal intelligence, which the corporations could own and easily replace. Besides the TTA, notable megacorporations include Tau Ceti Prime, which specialises in natural and artificial foodstuffs and was the first colony to secede from the TTA; Enclave LTD, which manufactures habitation structures of all sizes; United Industries, a relatively young corporation which stays neutral of inter-corporate conflict by manufacturing and selling arms and armour; and the recently established B’Hazard Mining, which specialises in deep gravity mining. In addition, the Galaxy Worker Alliance is all but a corporation of its own, but specialising in workers’ rights. The GWA is responsible for negotiating the limited rights which Beta-Class Humanoid Lifeforms currently possess. This includes the right to purchase their freedom, known as their ‘Buy-Back’ value. It is these Beta-Class Humanoid Lifeforms that the players roleplay in the Justifiers RPG, a humanoid animal such as a bear, bison, gila monster, owl, rhinoceros, or turtle, who is trained as Field Scientists (Life, Social, or Planetary Sciences Specialist), Field Engineers (Electrical or Mechanical Engineering Specialists), Field Operatives (Scout, Security, or Pilot), and Field Doctors. Some of them may also possess cybernetic enhancements and some may also have psionic powers. To create a character, a player rolls percentile dice for seven attributes—Strength, Dexterity, Constitution, Intelligence, Wisdom, and Agility. One of them can be raised to a value of sixty-five. Several factors are derived from these, most notably a character’s Base Skill Level and Base to Strike. All characters have a 5% chance to have one or more Psionic powers and may also have some cybernetics, although their price is factored into their ‘Buy-Back’ value. A player then selects a Beta Racial type, each of which can provide attribute modifiers, extra abilities, natural weapons, armour, movement, skills, and so on. A character receives skills for his career, cross training in other careers, and then a random number of elective skills. In terms of character progression, the Justifiers RPG offers two tracks. The first is a standard Class—or rather Career—and Level system. Whenever a character attains a new Level, he is given to sets of points; one to be assigned to his Body, Resistance, and Mental Strength and the other to be assigned to skills. Experience Points are earned for both completing missions and getting paid for them, which brings us to the second track and that is money. Justifiers get paid for completing missions as a team—anywhere up to a million credits and this is divided amongst the team members, the percentage depending upon a members’ rank. This money can be spent on equipment or upkeep, but primarily it is added to a character’s bank and saved towards his Buy-Back value. Mechanically, the Justifiers RPG is a very straightforward, simple percentile system. For the most part there is a list of mostly negative modifiers to apply to skills and attributes as needed. Combat again, is relatively simple and harsh. Fire combat takes place before melee combat, and in melee characters only have actions rather than actions and reactions. So when a player has his character decide to dodge or parry, he is also giving up a offensive maneuvre. It also only takes a roll under half of a character’s skill for an attack to become a critical strike, which increases the amount of damage done. So whilst a variety of armour is provided, combat can be fairly deadly. To support the combat aspect of the game, an extensive list of arms and armour is provided, ranging from simple swords and daggers right up to handheld Particle Beam Projectors or ‘blasters’ and laser pistols. A similarly lengthy list of camping and other survival gear is also provided as are descriptions of a few vehicles. Notable amongst these is a description of the shuttle used to transport Justifier teams via ‘Beaming Blind’. The shuttle contains everything a Justifier team needs, including vehicles, survival equipment, and the means to build a TransMatt receiving station. The vehicle lists are accompanied by a section on vehicular combat, but this again, is quite short. Rounding out the Justifiers RPG is a short scenario, ‘The Axon Confrontation’. Designed for new Justifiers who are owned by United Industries, the team is assigned to track down another team which has gone rogue and taken some valuable weapons prototypes with them. The team will be sent to the other team’s last known location and are expected to retrieve the prototypes at all costs. It is a decent enough scenario, primarily combat focused, but with just about room for a little roleplaying. Unfortunately, there are bits missing from the Justifiers RPG. The list of corporations is all short, so the motivations of each of them are unknown. There is no map of known space and there no adventure hooks with which draw the characters into the setting and its possibilities. Worse there are no planet descriptions and no means to create them, so no tables from which the Game Master can be inspired to write great adventures. Fortunately, the system was supported by a surprising number of scenarios and supplements given the size and scope of the original roleplaying game. That said, there is nothing to stop a Game Master from taking the concepts presented in the Justifiers RPG and applying them to the setting of another Science Fiction roleplaying game or taking the rules for creating worlds from another Science Fiction roleplaying game and using then to generate new planets for the player character Justifiers to explore and 'justify'. Physically, the Justifiers RPG is a relatively plain affair. The black and white interior—clearly designed on an Apple Mac given the roundedness of the game’s sidebar boxes—is complimented by a good mix of black and white line art. It does lack an index though and it could have been better organised. 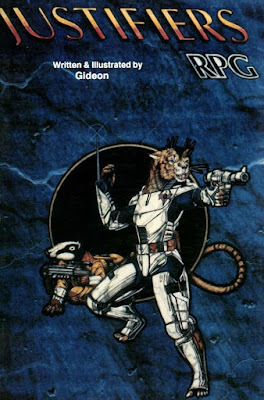 Justifiers joins a small number of RPGs that do ‘pets in space’, like FGU’s Other Suns; Albedo from Thoughts & Images, Chessex, and more recently, Sanguine Productions; Teenage Mutant Ninja Turtles Guide to the Universe, the supplement for Teenage Mutant Ninja Turtles & Other Strangeness from Palladium Games; GURPS Uplift, and any number of Science Fiction roleplaying Games which translates familiar Earth animals as alien species. Yet as much as the Justifiers RPG is an anthropomorphic roleplaying game, it is also something quite different, a ‘slaves in space’ roleplaying game. Like Expendables from Stellar Games, Bughunters for TSR, Inc.’s Amazing Engine, and to an extent, Khaotic from Marquee Press, the Justifiers RPG is about playing disposable property sent to do a dirty job. The characters literally work for the ‘Man’—a corporation—but whilst they are property, they also have rights and they can also buy their freedom and thus gain full rights. In this, they are more akin to indentured servants or even gladiators in that their freedom can be earned. How much that appeals thirty years on after the Justifiers RPG was originally published is debatable given how much gaming tastes have changed. Further, given that the player character role in the Justifiers RPG is to explore, pacify, and justify worlds, it is odd that this mission is never properly explained or explored. The Justifiers RPG is not a bad game, but it is not quite a complete game as it lacks a coherent background for the Game Master and her players to latch onto, descriptions of worlds and systems for the Justifiers to ‘justify’, and the means to both create the worlds and the missions. There are potentially interesting themes and ideas to be explored in playing the Justifiers RPG, ones which need to be handled with both care and maturity, but they may have to wait until there is a second edition of the roleplaying game. 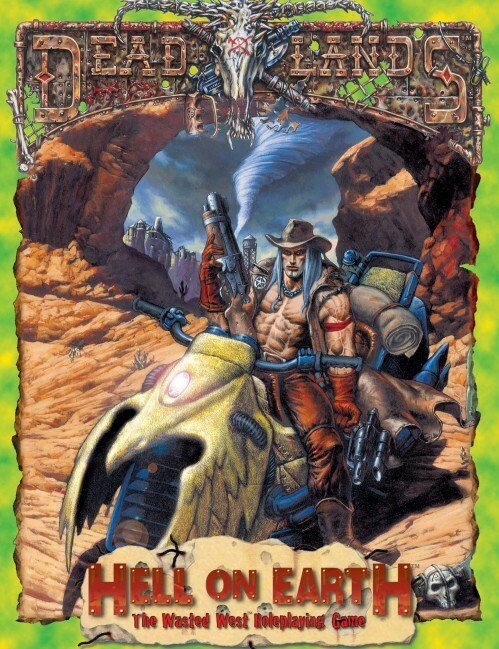 Published in 1998, Hell on Earth: The Wasted West Roleplaying Game is a roleplaying game with an identity crisis. On the one hand it is a standalone roleplaying game. On the other it is a sequel to Deadlands: The Weird West Roleplaying Game, which had proved to be a big hit for their publisher, Pinnacle Entertainment Group, two years earlier. It uses the same mechanics and it is set in the same background, only two hundred years later. It uses many of the same character archetypes as well as adding a few new ones and removing others. It is another genre mashup, but where Deadlands does horror and the Wild West to get the Weird West, Hell on Earth adds post-apocalyptic and fantasy to get the Wasted West. Hell on Earth also reveals all of the major secrets to the Deadlands storyline which had been hinted at in supplements released in the two years leading up to the release of Hell on Earth. All of which raises two fundamental problems with Hell on Earth. The first is background versus mechanics. The rules for Hell on Earth are those for Deadlands, barring the new and changed character types and genre rules, so if Marshals and players already had that roleplaying game—which seems likely given that the audience for Hell on Earth and Deadlands were essentially the same. Arguably this space could have been better devoted to more of the new background of the Wasted West—there is some background in Hell on Earth, but it does not feel enough, especially considering that it took another supplement, Wasted West, to give that background. This compounds the second issue, that of too many genres, which made the roleplaying game difficult to access. The horror-Wild West combination of Deadlands was an easy sell and an easy buy-in, but the horror-Wild West-post-apocalypse, fantasy mashup of Hell on Earth or ‘It’s the sequel to Deadlands’ was not as much. Setting up, running, and playing a scenario for Deadlands was easy because both Marshals and players knew both genres from years of exposure to both genres in film and television. Again, with Hell on Earth and its extra genres, not so much. So in explaining the set-up for the 2094 of the Wasted West, Hell on Earth goes both into some details as how this future came about and how the set-up of Deadlands is the foundation of that. It explains how Native American shaman, known as the Last Sons, in 1863 performed a ritual known as the Reckoning which unleashed malicious spirits that increased the fear levels nationwide, let magic into the world, fuelled mad science with a newly discovered glowing mineral known as Ghost Rock, and created monsters, cultists, and madmen. Their influence prolonged the American Civil War and permanently divided the United States of America into the United States of America and the Confederate States of America with great swathes of disputed territory between them. The need for Ghost Rock would ultimately send mankind to war on Banshee, another world where more of the weird mineral was discovered—as detailed in Lost Colony, the third roleplaying game in the Deadlands series—whilst at the same time bring about the Last War. This was not just a war fought with nuclear weapons, but nuclear-Ghost Rock weapons, and the contained within Ghost Rock the spirits of the damned. When they burned in the irradiated flash of the nuclear explosion, they raised the levels of fear even further, in the process turning the planet into a series of ‘Deadlands’, areas warped enough to draw out monsters from mankind’s nightmares. This ‘wasted’ land enabled those responsible, known as the Reckoners, to reveal themselves and stalk the land in waves of War, Famine, Pestilence, and Death—literally the Four Horsemen of the Apocalypse. Hell on Earth introduces numerous new character types. Doomsayers are ‘radiation priests’ who believe the irradiated and the changed will inherit the Earth and that ‘norms’ are normal humans are doomed. Most cult members see it as their duty to hurry norms to their deaths, but others have rebelled against this and want to protect both people and their future without the slaughter. Doomsayers can blast their enemies with radiation or technology with EMP, cause mutations, and can tolerate radiation. Junkers are ‘techno-wizards’ of the Wasted West who scavenge for pre-war technology, then use a G-Ray Collector to store the power of Ghost Rock into spirit batteries which power the devices they build. Typical devices include chainswords, motion detectors, junkguns, and so on—all powered by the arcane energy of Ghost Rock. Sykers are powerful psychics who were trained by various governments to fight against the insurgency on the Banshee. They can use powers like Arson, Brain Blast, and Tattletale, but suffer strain in doing so. Templars are holy warriors dedicated to helping those in need, but only if they are deserving of such help. Armed with a sword they forge themselves, they gain minor blessings like Lay on Hands and Armour of the Saints which help them in their mission. Other archetypes in the Wasted Waste include Gunslingers, guns for hire; Indian Braves, Native Americans who eschew technology and stick to the Old Ways; Law Dogs, who wander the land keeping the peace; Ravenites are Native Americans who embraced technology and wealth rather than the Old Ways and are always well equipped; Road Warriors are nomads, ever travelling in search of parts and fuel for their vehicles; Savages grew up after the Last War and distrust technology, whereas Scavengers search the ruins of the past for it; Soldiers are survivors of the Last War; Tale-Tellers are storytellers who spread hope and news with their tales; and Traders find and sell goods as they can. It is also possible to play certain other character types from Deadlands in Hell on Earth, primarily those with arcane powers. They include the Blessed, Hucksters, Voodooists, and Martial Artists, though to bring Voodooists and Martial Artists into the Wasted West, the Marshal—as the Game Master in both Deadlands and Hell on Earth is known—will need access to the relevant sourcebooks. Lastly, just as in Deadlands, a character in Hell on Earth can die and come as one the Harrowed, one of the ‘undead’ who constantly fights with the evil spirit that reanimated him for possession of his corpse and who is capable of developing his own unnatural powers. As in Deadlands, the character creation process in Hell on Earth is slightly complex. A character has ten Traits or attributes. His Corporeal Traits are Deftness, Nimbleness, Quickness, Strength, and Vigor, whilst his Mental Traits are Cognition, Knowledge, Mien, Smarts, and Spirit. Each Trait has an associated die type—four-sided, six-side, eight-sided, ten-sided, and twelve-sided, and a Co-ordination, an associated number, typically ranging between one and four. Combine the two and the player has a number of dice that he rolls when his character is undertaking an action, for example, three eight-sided dice if the character has a Deftness of 3d8 and wants to shoot at some varmint. In addition, a character has Aptitudes that represent skills, talents, and trades, such as Fannin’, Shootin’, Teamster, Trackin’, and so on. These are rated between one and five and use the same die type as Trait that the Aptitude is associated with. So the character with a Deftness of 3d8 uses eight-sided dice for all associated Aptitudes, for example, Shootin’ and Speed-Load. To create a character, a player draws twelve cards from a standard deck of playing cards, discarding two. Any two cards can be discarded bar draws of two and Jokers. The former grants or penalises the character with the four-sided die type, whilst the Joker grants the character the twelve-sided die type and one of two twists. If Black, then an obligatory dark backstory devised by the player and the Marshal together, although a Mysterious Past table is included in the book for the Marshal. If Red, the character is further affected by the supernatural and radioactive energies left over from the Last War. The suit and number of each card determines the type and number of dice for each Trait. So for example, ‘4 of Diamonds’ gives a Trait of 2d6, whilst the ‘Jack of Spades’ gives a Trait of 4d8. Once generated, a player assigns them as he likes. In addition, a number of secondary stats are derived from the various Traits, notably the number of points to assign to Aptitudes, from the character’s Knowledge, Smarts, and Cognition die types. A character can also have up ten points’ worth of Hindrances, the amount spent on Hindrances generating a corresponding amount with which to purchase Edges. Our sample character is Walter-5, a Psyker was once Doctor Walter Gallardo, a med student in pre-war Chicago. He was planning to become a surgeon but was discovered to be a Psyker, conscripted by the army, and after his training, was sent to fight the insurgency on Banshee. There he served as the squad medic, but the truth is that he did not want to fight and only did so when he was forced to. Otherwise Walter does not like to talk about what happened off world, although he still suffers nightmares about it. Since returning to Earth, he has walked the land offering to help where he can. To undertake an action in Hell on Earth, a player rolls the dice for the appropriate skill. For example, if Walter-5 has to shoot a Radrat, his player rolls Walter-5’s Deftness/Shootin’ Aptitude (1d6), whereas if he wants to determine if the weapon that the Radrat has in its nest is the legendary possessed six shooter that he and his posse has been looking for, then the Marshal might have the player roll Walter-5’s Cognition/Shootin’ Aptitude (1d8). In either case, the player rolls the dice and counts the best result, attempting to beat a Target Number set by the Marshal, ranging from Foolproof (3) and Fair (5) up to Hard (9) and Incredible (11). Beat the target and the character succeeds, but by beating the Target Number by five, he can get a ‘Raise’, and by beating it by ten, he can get two ‘Raises’. Each Raise improves the success of the skill attempt. ‘Raises’ are made possible because dice in Hell on Earth explode and become Aces, enabling rerolls to increase the total. Combat in Hell on Earth builds on these basic rules, but uses the deck of Playing Cards, known as the Action Deck, to determine initiative order and a Quickness roll by each participant to find out how many cards they draw and thus how many actions they have. Cards and thus Actions can be held until a player wants to act in a round, whilst Red Jokers enable a character to interrupt another character or NPC and Black Jokers force a character to discard his highest other card and a reshuffle of the Action Deck. Rules allow for Drawing a Bead, Fannin’, Shootin’ from the Hip, two-gun action, the Rifle-Spin, and so on, all straight out of the Weird West of Deadlands, but updates the firearms rules to allow for pumping shotguns one-handed, automatic weapons, and so on. The rules introduce more armour, but also add armour-piercing rounds. When a character takes a hit, he loses Wind, but can also suffer Wounds to various parts of his body. Other new rules in Hell on Earth cover new environmental dangers like Ghost Storms, which caused by the Ghost Rock Bombs, can inflict spiritual damage as well as radiation damage and mutations. Radiation on the Wasted West has a spiritual component to it also. Vehicle rules also allow travel via cars and vans, as well as supporting the Road Warrior archetype and Mad Max-style games. Every character also starts each session with three Fate Chips. These come in three colours. White chips allow a character to roll an extra die on Trait or Aptitude checks, whilst Red chips let him add an extra die to the highest die rolled on a check at the cost of allowing the Marshal to draw a Fate Chip of his own. Blue Fate Chips act like Red chips, but without the benefit to the Marshal. Both White and Red Fate Chips are earned when a player does anything clever or when his Hindrances make his life difficult, but Red chips can also be handed out when a character finds important clues, defeats a minor opponent, and so on. Blue chips are handed out for exceptional roleplaying, discovering a critical clue, or for defeating a major villain. Fate Chips can also be converted into Bounty Points which can spent to improve a character’s Traits and Aptitudes. Beyond these basic rules are the rules for the ‘Weird’ things that the characters can do in Hell on Earth as Doomsayers, Junkers, Sykers, and Templars. In each case, the character makes the appropriate Aptitude roll—so Faith for both Doomsayers and Templars, Science (Occult Engineering) for Junkers, and Blastin’ for Sykers, and in general, the mechanics for each Arcane Background are roughly the same, although there are small differences for each. So each Doomsayer also has a mutation and knows the Tolerance Power in order to soak up all of that lovely radiation, but there is a limit to the number of times a Doomsayer can use his Powers, represented by his Strain. Sykers simply suffer Strain when using their Powers. The Arcane Background that is different is that of the Junker, who collects or scavenges parts, and then builds and modifies devices which are then powered by Spirit Batteries. Like the Mad Scientist of Deadlands, the Junker also gets to concoct theories, determine and buy powers to work the device, and assemble the components, all before building it. For players, this perhaps the most complex of the Arcane Backgrounds in Hell on Earth, involving a lot more than just selecting a power and then getting to roll it in play. There is though, the possibility of Backlash from the Spirit World when attempting to build a Power into a new device. One problem with the Junker rules is the lack of Powers to choose from. The three given—Damage, Sensor, and Trait (as in to assign a Trait like Deftness or Cognition, which then allows Aptitudes to be purchased for it)—provide a limited range of devices which a Junker can build. Each of the different Arcane Backgrounds gets its own chapter in the rulebook, each explaining how they work and how playing a character of that type works as well as one devoted to the Harrowed and another to Fear in Hell on Earth. They are in the middle section of the book labeled ‘No Man’s Land’, between ‘Posse Territory’ and ‘Marshal’s Territory’, for the players and the Marshal respectively, just as in the Deadlands: The Weird West Roleplaying Game. These two sections are specifically written for the players and the Marshal, and whilst the Marshal has to read all of the book, the players only need to read ‘Posse Territory’. It is only if he wants to play a character with an Arcane Background that a player needs to read the appropriate chapter in the ‘No Man’s Land’ section. In ‘The Marshal’s Handbook’, the lid is lifted on the secrets of Hell on Earth—what caused the American Civil War to last longer than 1865, the true nature of Ghost Rock, who the Reckoners are, and so on. This though, as the book suggests, is a future, a possible future awaiting the nineteenth century of Deadlands. It is possible for the posse of player characters in a Deadlands campaign to prevent the events that lead to the Wasted West, which means that Hell on Earth can be played as an alternate timeline rather than as a sequel. The bulk of ‘The Marshal’s Handbook’ is dedicated to discussing various aspects of the roleplaying game’s rules as well as providing rules for both fear and terror—the former the environmental factor which can be escalated into creating Deadlands, the latter the rules for handling characters getting scared; what to do when a player character dies—the answer being to let them come back as undead or ‘Harrowed’ and have them fight their inner demons; possibilities for character mysterious pasts and mutations; and a short bestiary. In fact, at just thirteen entries, the bestiary is very short. Physically, Hell on Earth: The Wasted West Roleplaying Game is as light as Deadlands: The Weird West Roleplaying Game felt in the hand. The book is decently written the editing is good, but the artwork does vary in quality. The black and white artwork often tends to be grey and murky, but unlike Deadlands, the colour illustrations in Hell on Earth are much, much better, not being as muddy. Of course, being based on Deadlands, the mechanics in Hell on Earth not only suffer from exactly the same issues, but they are exacerbated by the switch to a new genre, from the Wild West to the Post Apocalypse. Now the mechanics were and are appropriate for Deadlands, but they are nevertheless often cumbersome and clunky, with dice and Playing Cards and three—sometimes four—different coloured Fate Chips. Indeed, having three types of Fate Chips just complicates the game, as does having a different ruleset for each of the four Arcane Backgrounds. Fundamentally though, there is a disconnect in the mechanics between a character’s Traits and Aptitudes since the two are never rolled together and Aptitudes have a more direct application in the game than Traits do. In fact beyond providing the die type for its associated Aptitudes, each Trait has relatively little effect on a character and thus even lesser effect on his Aptitudes. Instead Traits only really come into play when a character lacks an Aptitude, in which case the associated Trait is rolled and a heavy penalty levied. At the same time, a character has too many Traits all doing variations upon the same thing. Thus Deftness, Nimbleness, and Quickness are all variations upon a character’s dexterity, whilst Cognition, Knowledge, and Mien are variations upon his intelligence. What is not really present in Hell on Earth though, is any real advice on scenarios or campaigns. There is a page on adventure set-up, but nothing on the types of games that can be played or the types of adventures or how to get a posse of disparate player characters together. In Deadlands this was not an issue because its combination of genres was simple and familiar, so it was easy for the Marshal to write for, but with its disparate array of genres and character types, this is definitely not the case for Hell on Earth. The consequences are that it feels underwhelming and that is a problem with Hell on Earth from start to finish. Certainly, the rules are all there and will cover most situations and there are plenty of interesting character options and there are roleplaying hooks for them in their particular sections. Yet the lack of overall background, the lack of adventure hooks, and the lack of monsters in combination with the underwritten background, combine to give the feeling that there is not enough to support a campaign and not enough to support the array of character options included. The fact that Hell on Earth reprints much of the content from Deadlands and that another book—the supplement, Wasted West—is needed if the Marshal and her posse want more background to the setting, not only compounds that feeling, but drives it home. Despite the fact that Hell on Earth makes a big thing of its secrets being revealed in this core book, the authors are at best economical with its contents, at worst, stingy. Where Deadlands proved popular, winning awards, and being supported by multiple supplements, Hell on Earth was less so. Like Deadlands, there was a d20 System adaptation published in 2002 and a version for use with Savage Worlds called Hell on Earth Reloaded, published 2012. Notably, this moved the timeline on to 2097. Hell on Earth is proof that lightning does not strike twice, for Deadlands was a success, both critically and commercially, whereas Hell on Earth not as much. Deadlands is revered and remembered today, whereas Hell on Earth not as much. The problem was twofold. In Deadlands, the setting and its genres were familiar and easily accessible and gameable, and the mechanics were appropriate. In Hell on Earth, the setting and its genres were not as familiar, not as easily accessible and gameable, all because there were too many genres and not enough support in terms of the background and advice for the Marshal. There are some great character options and a potentially interesting setting presented in Hell on Earth: The Wasted West Roleplaying Game. It is just a pity that not enough of that potential is realised in the core book and that it would take other supplements to properly realise it.